LinkedIn is by far the world’s largest professional network with more than 380 million members in over 200 countries and territories. But it isn’t meeting the needs of everyone, leading to the creation of several sites positioning themselves as the go-to professional network for niche industries. If you work in hospitality, you’ve got Industry. If you’re a doctor, head over to Doximity. If you’re an IT professional, join SpiceWorks. And if you work in the entertainment industry, you have Stage 32. 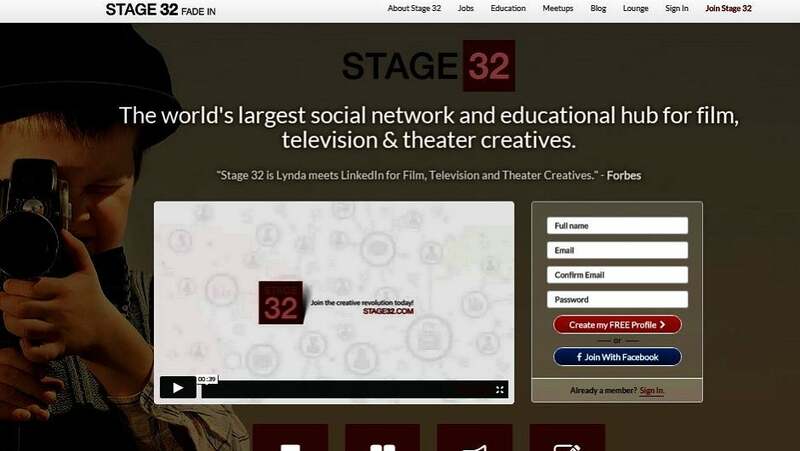 Stage 32 goes beyond the traditional benefits offered by professional networks (e.g., making connections, looking for jobs, staying up on news, etc.) by providing cutting-edge online education to a global population of people looking to make it in the ever-evolving entertainment industry. The integration of massively open online courses (MOOCs) makes strategic sense, which is likely why LinkedIn acquired Lynda for $1.5 billion. It also allows Stage 32 to keep membership free while generating revenue through its pay-to-play business model. Indeed, whether you’re a producer, screenwriter, director, actor, cinematographer, editor, art director or composer (or some combination of these) Stage 32 offers classes to meet your specific needs. Some of their most popular ones of late include “The 5 Secrets to Financing Your Next Indie Film” and “The Art of Indie Producing.” The average cost per webinar ranges from $39-59 with longer online courses (2-8 weeks) landing somewhere between $99-799. All of the teachers are industry executives that have excelled in their chosen field. When asked what their motivation is, Stage 32’s Managing Director Amanda Toney says, “They do receive a percentage of the revenue generated, and some of them teach for exposure. But most do it because they want to give back. There’s a community feel even to our education. Many have gone so far as to donate their payment to an arts charity.” Jon Sperry – a highly respected dialect coach who has worked with Harvey Keitel, Sofia Vergara, and Russell Crowe – taught a Stage 32 class that was attended by members from over 40 different countries. Since launching 2011 global membership has grown to be over 500k people actively collaborating and supporting each other to move film and television projects forward. In the past year alone the company has amassed over 1k hours of educational content and generated over $1 million. Among those that have paid for a Stage 32 class, 91% say they’ll do it again in the future. The idea for Stage 32 came when Botto was attending yearly film festivals like the American Film Market (AFM) and observed a palpable frustration among many attendees that their opportunities for connection, collaboration and breakout success were so disjointed and infrequent. He strongly believed that there needed to be an online destination serving the specific needs of these individuals, and knew he had the experience to bring it to life. Botto had already experienced some entrepreneurial success. Throughout the 90s he ran a consulting business with his brother that helped traditional companies establish an online presence. In 2000 he launched a men’s lifestyle magazine called RAZOR and served as the publication’s Editor in Chief and CEO for the next six years, pursuing acting and writing projects on the side. After leaving RAZOR he began gaining serious traction as a screenwriter and producer. This is what landed him in the film festival circuit, and gave him the industry expertise and professional network needed to launch Stage 32. When the beta was ready in 2011 Botto emailed a link to 100 of his industry contacts, asking them to send it along to five more people if they enjoyed the experience. Membership took off. Some of Stage 32’s growth has to do with marketplace dynamics. The continued proliferation of media network and online distribution channels has increased demand for quality content. Large studios are traditional TV networks are snapping up online content providers (e.g., Maker Studios, Fullscreen, Awesomeness TV, etc.) to ensure they don’t get left behind, and agents and managers are hungry for talented new writers that are able to authentically connect with niche audiences of viewers. A huge number of successful shows and movies are being made outside of the traditional studio system, and the DIY culture in Hollywood has become more and more mainstream. Stage 32 is teaching the evolution of the entertainment industry as it’s happening, and more people than ever are throwing their hat in the ring. To be sure, there are other places to go for education if you’re seeking success in the entertainment industry. Well-respected academic institutions, such as USC’s Film School, and still arguably the best places to hone your chops and network – not to mention receive a highly credible degree. But those institutions are only available to select few due to both admittance and cost. There are solid continued education offerings like UCLA Extension, which has 17 categories within the entertainment and music industry where online classes are currently being offered. Each class offers credits towards a degree, but the average cost is more than $500/class. Again, access is limited. Headquartered in the Manhattan Beach area of Los Angeles, Stage 32’s team has grown to 10 and the company is projecting 50-75% YoY revenue growth. Up to this point the company has been completely bootstrapped and has not raised an official round, but Botto says he has been approached and has begun exploring financing possibilities to fast track growth. Freelance columnist, research & strategy consultant and singer/songwriter that lives in LA and writes about tech, entertainment and social impact.